Featuring the ultimate waterproof flooring from TORYLS Smart Floors. Thanks to it’s waterproof feature, this floor is a fantastic choice for Kitchens, Bathrooms and Basements. TORLYS EverWood looks great in Bedrooms and Living rooms too. Seen here: TORLYS EverWood Elite Waverly. Learn more about TORLYS EverWood here, or request an estimate from Woodchuck Flooring today. Throwback to 2013: Woodchuck Flooring completed a Commercial Installation for the new Anthropologie Retail Store at Yorkdale Shopping Centre in Toronto. Merchandising really makes a store, great job to the Anthropology team and thank you for choosing Woodchuck. Check out the update on the new Fairway Collection at Deer Creek project in Ajax, Ontario. The Staging by Maison J&J Inc. is almost complete in the model home and The Lauzon Flooring Authentik Red Oak Nostalgia Hardwood Flooring (With Pure Genius) that was just installed looks absolutely amazing. The sales centre is scheduled to open this weekend. 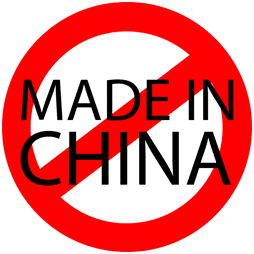 It probably won’t surprise you that lately we’ve had a lot of customers telling us they don’t want any products made in China. It seems most of them have been convinced that all products made in China are hazardous and that the off gassing will make you sick. This also leads to the conclusion that products made elsewhere – such as in Europe or North America – are always safe and of high quality. Are these assumptions correct? No! Judging a product simply by its country of origin is silly. I’ve always known this, but on my first buying trip to China 2 ½ years ago, it became all too clear just how true this really is. When a distributor asks a manufacturer to produce a product, they are very specific. They specify sizes, finishes, construction methods, and the raw materials that will become the final product. This process ensures they get the product they want and that they get what they’re paying for. I had such a conversation with potential suppliers in China. Through my agent I outlined the specifications of the product I wanted to distribute. Thanks to the standards that have been set for wearability, density and emissions, these requirements are easy to outline. After these details were established, the next part of the discussion may surprise you. Pardon? Yup, you got it. What is claimed to be in the box is not necessarily in the box. Needless to say I was a bit shocked. I explained that we want the description on the box to accurately describe the product we were delivering to our customers. That was that. No pressure, no problem. Since there is no regulatory body that tests each imported product, it boils down to the honesty and integrity of the company you are dealing with.